At the beginning of the year, I set a goal to make 52 charity quilts before the end of 2018. This month, I got two more quilted and ready for binding! The quilting really goes so much faster on my longarm than it did on my domestic! I even had help quilting one of them this month! My mom came to visit, and she got to test drive my new longarm! I now have quite a stack of charity quilts that are quilted and waiting for binding! (These are the five from last month.) All of these quilts are from The Road Trip Quilt pattern by Cluck Cluck Sew. Both of the quilts for this month are quilted with an all-over free-motion stipple or meander in Aurifil 50wt Stone #2324. I'm finding that the Stone color goes with every single Debbie Mumm fabric whether it's Christmas, Halloween, gardening, etc. It's really a great color for this project! How about you? Did you get any charity sewing done this month? Be sure to link up! Yay! 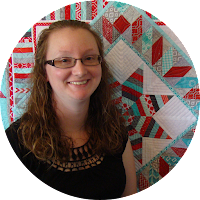 Now that you have your longarm you can really get a bunch of quilting done! When I saw that longarm I thought that would really help with reaching our goals. Nice to have Mom there to help and learn too! 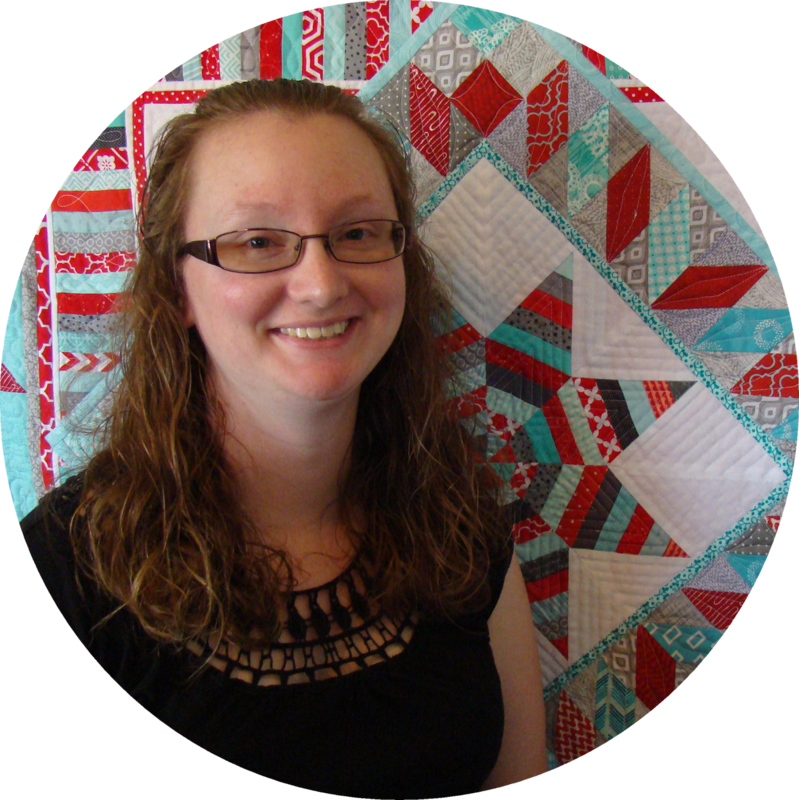 Amazing goal to create 52 donation quilts in one year! 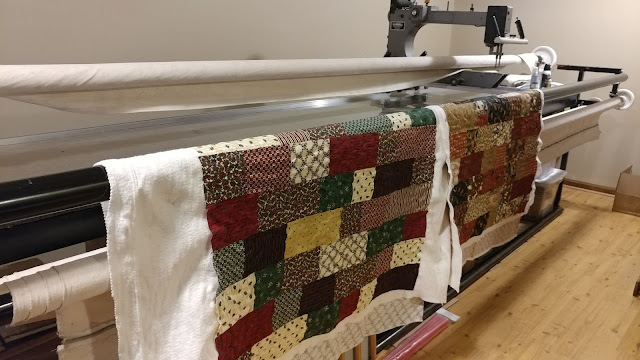 Never knew you could load up multiple quilts on a longarm. You're doing so well! 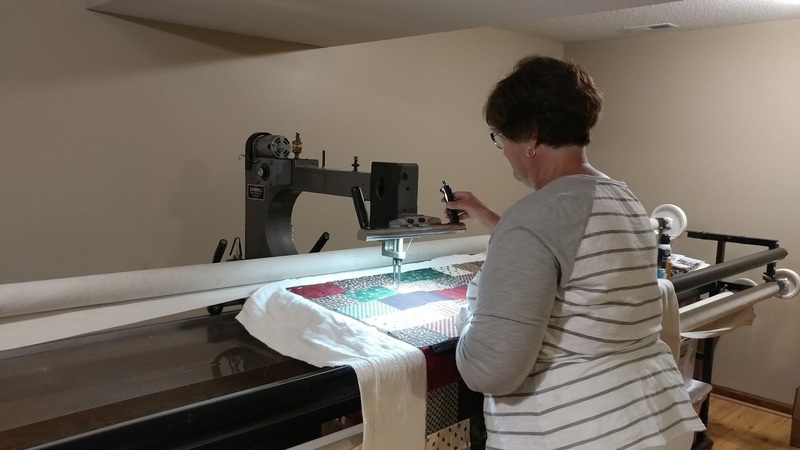 I'm glad you already have your longarm set up after your move. That's a daunting task. 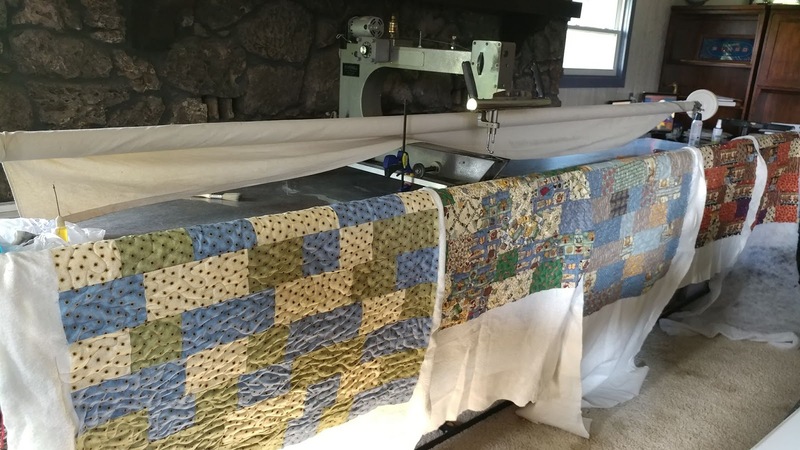 Depending on the size of your quilts and the type of backing fabric you have, you may be able to save yourself some time by loading several quilts at once side by side. I've done this before, and it can make a big difference! 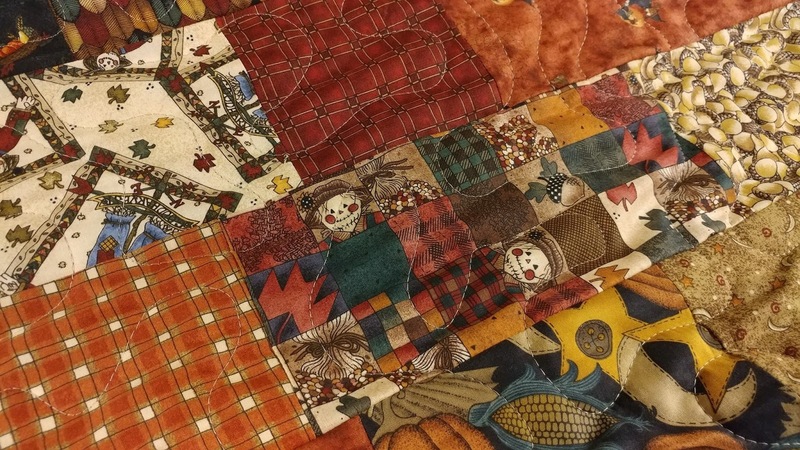 I use a single piece of backing fabric and a single length of batting from my roll, and just put the quilt tops right next to each other and quilt across all of them at once. You are really making great progress. I'm thrilled for you that your mom visited and got to test drive the new machine. I hope you keep the mojo on your quilting. I may be weird and I like to bind. I put my binding down by hand and enjoy that part. Somehow I've missed that you've been doing this all year! How awesome this is. I will have to try to remember to link each month. I got here by way of a link from Nancy, and was surprised it was you. =) How wonderful to have your longarm set up and already smokin'! Hi Laura, I want to comment about a post you made in April of this year - Vintage Made Modern. It's the Jacob's Ladder pattern that you made the fabulous star and did the spiral quilting. I'm getting excited about piecing again and have been seriously looking for inspiration. I was looking at Pinterest in the wee hours of the morning this morning and I found this vintage quilt - https://www.pinterest.com/pin/343047696611203248/ I rarely buy a quilt magazine and I was in Walmart this past weekend getting a few things and I've been bored as I'm mostly chair bound at the moment with bowel issues, so I decided to pickup the last rack copy of Better Homes & Gardens American Patchwork and Quilting. I'm only about 1/2 way through the magazine and you guessed it - there is a quilt - 100% Charming, of course, using charm squares and the Jacob's Ladder pattern. I had not pegged the Pinterest quilt as a Jacob's Ladder pattern - I thought without drawing it out that it was a snowball block and 4 patch (16 squares) with some HST. The photo of the quilt has aquas, reds, limes, etc. for a more modern feel to it. I don't particularly care for having the center solid block broken into 4 squares with each snowballed - but you do what you have to do - I feel that it detracts from the area for quilting. Anyhow, you were on the leading edge for the inspiration for the quilt. This just have to go on my bucket list. I think it might be nice to use some scraps in one of these quilts, too. Of course, that was not your purpose for your beautiful quilt. I'm glad that I have found your blog and am following (not stalking) you. Just FYI - I was a math major in college and an education major, too. I just knew that I wanted to follow in my mother's footsteps and be a math teacher. I took the first computer class that was offered as a computer science class - not an engineering class. I applied for computer jobs after graduation and the rest was history. I did that for about 30 years until I had a forced retirement. Thanks for sharing some of your beautiful creations with the rest of the world. Oh yeah, my daughter is a high school math teacher.